I have been rereading all of my blogs in order to compile an edited ebook documenting the journey from inception to breaking par/5,000 hours and have rediscovered a number of good memories. Later today I am heading out to play a round at Heron Lakes on the Great Blue course on a lightly raining Portland day and just read a post from the first day I ever walked on a regulation golf course. It happened to be that same track, but 3.5 years later my on-course goals have slightly changed. Nowadays I’m aiming to shoot par from the back tees, back then I was just excited to walk 9 holes. It’s important for me to remember that not long ago I was a complete newbie to this game. Reading these posts allows me to stay focussed and to remain positive. The power of a good journal. Yes!! What a day! 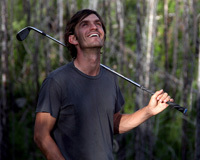 It was a pretty crazy day, actually, but as far as golf goes, it was an amazing day! The fine gentlemen working out at Heron Lakes let me head out onto the course to play some holes from about 30 yards out. Seeing as it was absolutely pouring out, I basically had the course to myself so headed out to play the back nine of the Great Blue course. For as much time as I spend out at Heron, I’m kind of surprised that this was the first time I’d actually walk part of the course, but perhaps good things come to those who wait. I set it up to play 27 “holes” of golf. I played three balls from roughly 35 yards each on every hole of the back nine. Since I was pitching from a bit of distance I made all of them a par 3 (quite a short par 3, but I’m a newbie) and am happy to say that I scored an 81 on the day, making it an even par which is a great benchmark for my first time out on a course! Not sure what a PGA Pro would shoot, but can assume it would be around a 55-60, so I have a LOT of work, as always, but it’s nice to have a score to beat now and I hope to make it out there more often, especially on the rainy slow days when nobody else is braving the course. In the picture below, it’s hard to see, but I pitched from about 30 yards away and from about 30 feet above the hole, but in spite of the bunker and the stream of water cutting through the green landed it within five feet! One of a handful of birdies I shot today. One of the 27 “holes” I played today, it’s hard to see but the ball’s pretty close! 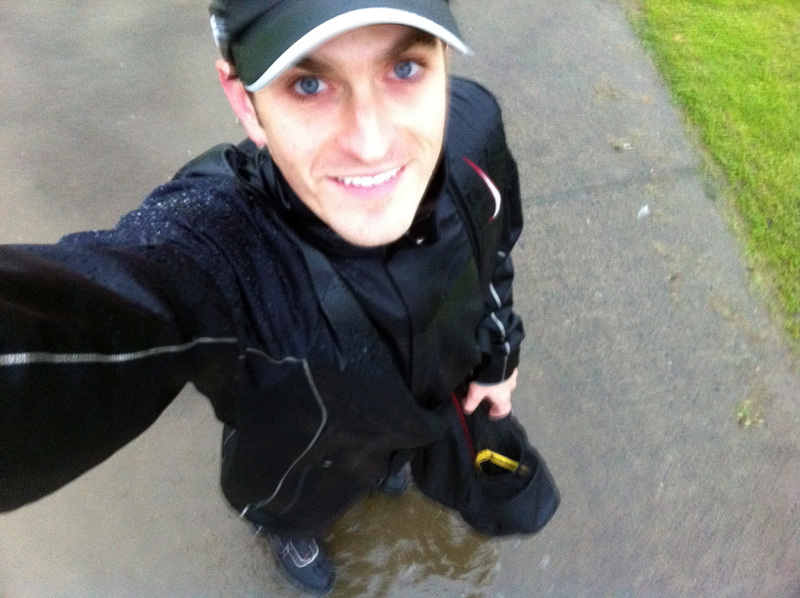 Not sure if you can tell, but I’m standing in about 3 inches of water, the entire course was completely flooded, as was basically all of Portland, more on that further down.. Although I had the right gear on, there was absolutely no chance of staying dry today. 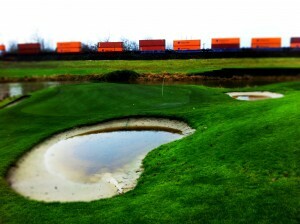 I loved the view from this little hill, looking out over the 14th green with a train passing in the distance, nice! Between the two soaked bunker, the lake and the train, this is a tough shot. What a day! A great day!! 3 Responses to "Flash from the past"
You need to throw in a new video of your current swing. Also nice to see your handicap is dropping. Keep at it. Great post, made us smile! I love these kinds of look-backs. I think it brings a lot of perspective to just how far you have come. We do the same with Isabel (tennis player-daughter). We film every week, and then look back on them periodically to see how far she has progressed. It’s absolutely amazing. I hope you’re continuing to film. I found a few vids of you on Youtube where you were doing a stroke by stroke walkthrough of a course, but they are all older than 1 or 2 years (the ones I found were anyway). Please let me know if you’re doing anything like that currently, would love to see how your swing has improved. Keep up the great work Dan, you’re a massive inspiration. And yes, sign me up for a copy of the ebook!!! Bracing myself for our golf seasons winter weather at the minute. The past month of autumn has been excellent and that has helped the practise routine immensely. June, July, August though are when the winds and rains on the coast are at their peak and will have me playing hard to keep on track of dropping the goal of a minimum of one stroke a month. 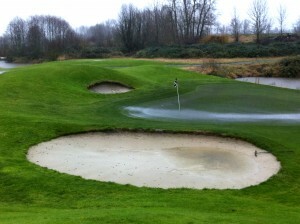 It is fun playing in the stormy conditions and the sense of satisfaction after 18 holes against the elements is awesome. As with you I have kept a blog since 2009 on my golfing journey and it is now on the home straight.